Colette Gaiter does not work for, consult, own shares in or receive funding from any company or organization that would benefit from this article, and has disclosed no relevant affiliations beyond their academic appointment. In the 2016 presidential election, Donald Trump won the white vote across all demographics except for college-educated white women. He did especially well among working class white voters: 67 percent of whites without a college degree voted for him. Some post-election analysis marveled at how the white working class could vote against its own interests by supporting a billionaire businessman who is likely to support policies that cut taxes for the rich and weaken the country’s social safety net. Since the New Deal, the Democratic Party has been seen as the party of working people, while Republicans were considered the party of the elites. Donald Trump was able to flip this narrative to his advantage. Election 2016 balkanized issues and made it seem impossible to work on racism, sexism, poverty and economic issues all at once. A core question moving forward for social justice advocates and the Democratic Party is how they can move beyond identity politics and attract working-class voters of all races, building stronger coalitions among disparate groups. One place to look for inspiration and instruction might be 1960s social movements that understood the power of alliances across identities and issues. 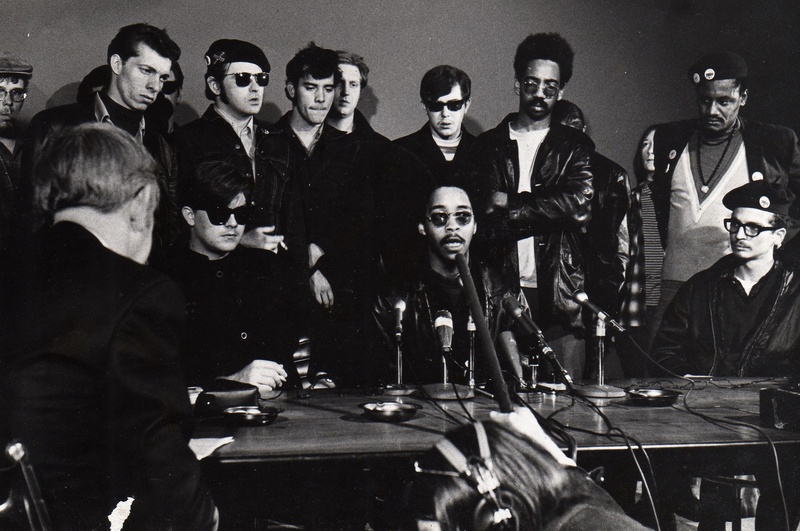 During this period, a radical coalition formed that might seem impossible today: A group of migrant southerners and working-class white activists called the Young Patriots joined forces with the Black Panthers in Chicago to fight systemic class oppression. So how did this alliance form? And how can its lessons be applied to today’s political moment? In the post-civil rights era, a militant Black Power movement emerged, with the Black Panther Party for Self Defense forming in 1966. Inspired by Malcolm X and other international black thought leaders, the group embraced armed struggle as a potential tool against organized racial oppression – a radical break from the philosophy of nonviolent protest. A large faction of the group developed in Chicago, where one of the party leaders was a young man named Fred Hampton. Chicago in the 1960s was a brutal place for poor people. Black, brown and white people all dealt with poverty, unemployment, police violence, substandard housing, inadequate schools and a lack of social services. Ethnic and racial groups each created their own social service and activist networks to combat every kind of oppression. One was the Young Patriot Organization (YPO), which was based in Hillbilly Harlem, an uptown neighborhood of Chicago populated by displaced white southerners. Many YPO members were racist, and they flaunted controversial symbols associated with southern pride, such as the Confederate flag. But like blacks and Latinos, the white Young Patriots and their families experienced discrimination in Chicago. In their case, it was because they were poor and from the South. In his short time as a Black Panther leader, Fred Hampton wanted to advance the group’s goals by forming a “Rainbow Coalition” of working class and poor people of all races. Former members of the Chicago Panthers and YPO tell different versions of the same story of how the groups connected: Each attended the other’s organizing meetings and decided to work together on their common issues. Over time, the Black Panthers learned to tolerate Confederate flags as intransigent signs for rebellion. Their only stipulation was that the white Young Patriots denounce racism. Eventually, Young Patriots rejected their deeply embedded ideas of white supremacy – and even the Confederate flag – as they realized how much they had in common with the Black Panthers and Latino Young Lords. In the end, the Illinois Panthers brought together various elements of the black community, Confederate flag-waving southern white migrants (Young Patriots), Puerto Ricans (Young Lords), poor white ethnic groups (Rising Up Angry, JOIN Community Union, and the Intercommunal Survival Committee), students and the women’s movement. The disparate groups under the coalition’s umbrella pooled resources and shared strategies for providing community services and aid that the government and private sector would not. Initiatives included health clinics, feeding homeless and hungry people, and legal advice for those dealing with unethical landlords and police brutality. Almost 50 years after the original Rainbow Coalition, the U.S. electorate remains divided along racial lines. Even though Donald Trump asked black Americans, “What do you have to lose?” by voting for him and abandoning the Democratic Party, it didn’t work: Only 8 percent of black voters (and 28 percent of Latino and 27 percent of Asian voters) cast ballots for Trump. Blacks and Latinos are well-represented in the working class, and people of color will become the majority in the working class in 2032. A button depicts the partnership between the Young Patriots and the Black Panthers. Much 2016 post-election attention has focused on working-class white voters, who have been characterized as “forgotten” and “angry” for being left out of the economic recovery. Yet African-Americans have been far worse off; since the 2007 recession, the unemployment rate of African-Americans is nearly double that of Hispanics and more than twice that of whites. Hillary Clinton was the candidate who collected the most diverse voter base – the 2016 Democratic National Convention in Philadelphia looked like the Rainbow Coalition redux – and she was expected to win the election. However, that visual hid racism’s residual and deeply entrenched place in U.S. society. One of the lessons of the 2016 election is that the country is not as advanced in its work on ending racism and discrimination as most would like to believe. Donald Trump did not have to do much to capitalize on this. The coalition, bringing together seemingly polar opposite Black Panthers and Young Patriots, showed that real interactions allow people to understand that their struggles are not essentially different. Donald Trump probably was sincere when he invited African-Americans to join his movement. He simply didn’t realize that a glib invitation would not produce the same results as real coalition-building over a period of time.